In 2007, the National Park Service (NPS) Inventory and Monitoring Program directed the initiation of a benthic habitat mapping program in ocean and coastal parks in alignment with the NPS Ocean Park Stewardship 2007-2008 Action Plan. With 74 ocean and Great Lakes parks stretching over more than 5,000 miles of coastline across 26 States and territories, this Servicewide Benthic Mapping Program (SBMP) is essential. This program will deliver benthic habitat maps and their associated inventory reports to NPS managers in a consistent, servicewide format to support informed management and protection of 3 million acres of submerged National Park System natural and cultural resources. The NPS and the U.S. Geological Survey (USGS) convened a workshop June 3-5, 2008, in Lakewood, Colo., to discuss the goals and develop the design of the NPS SBMP with an assembly of experts (Moses and others, 2010) who identified park needs and suggested best practices for inventory and mapping of bathymetry, benthic cover, geology, geomorphology, and some water-column properties. The recommended SBMP protocols include servicewide standards (such as gap analysis, minimum accuracy, final products) as well as standards that can be adapted to fit network and park unit needs (for example, minimum mapping unit, mapping priorities). SBMP Mapping Process. The SBMP calls for a multi-step mapping process for each park, beginning with a gap assessment and data mining to determine data resources and needs. An interagency announcement of intent to acquire new data will provide opportunities to leverage partnerships. Prior to new data acquisition, all involved parties should be included in a scoping meeting held at network scale. Data collection will be followed by processing and interpretation, and finally expert review and publication. After publication, all digital materials will be archived in a common format. SBMP Classification Scheme. The SBMP will map using the Coastal and Marine Ecological Classification Standard (CMECS) that is being modified to include all NPS needs, such as lacustrine ecosystems and submerged cultural resources. CMECS Version III (Madden and others, 2010) includes components for water column, biotic cover, surface geology, sub-benthic, and geoform. SBMP Data Archiving. The SBMP calls for the storage of all raw data and final products in common-use data formats. The concept of "collect once, use often" is essential to efficient use of mapping resources. Data should also be shared with other agencies and the public through various digital clearing houses, such as Geospatial One-Stop (http://gos2.geodata.gov/wps/portal/gos). To be most useful for managing submerged resources, the SBMP advocates the inventory and mapping of the five components of marine ecosystems: surface geology, biotic cover, geoform, sub-benthic, and water column. A complete benthic inventory of a park would include maps of bathymetry and the five components of CMECS. The completion of mapping for any set of components, such as bathymetry and surface geology, or a particular theme (for example, submerged aquatic vegetation) should also include a printed report. 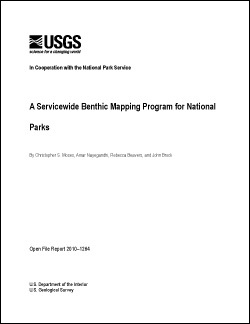 Moses, C.S., Nayegandhi, Amar, Beavers, Rebecca, and Brock, John, 2010, A Servicewide Benthic Mapping Program for National Parks: U.S. Geological Survey Open-File Report 2010–1264, 82 p.